Serenity (Sai-Lai) Lee is a senior majoring in Psychology and minoring in Intergroup Relations Education. 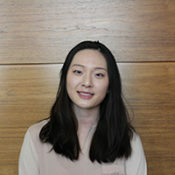 She is a research assistant for the Identity, Diversity and Leadership Lab and the Psychology of Inequality Lab, and is head research assistant for Julia Jooa Lee, the Center’s Postdoctoral Fellow. After taking part in the Magnify Program of Spring 2016, she became motivated to connect Positive Organizational Scholarship with Diversity & Inclusion scholarship. She intends to use that intersection as a lens for research about empowering and resourcing marginalized individuals in organizational contexts. She is excited to learn from her experiences in the +LAB and to be a part of a community focused on disseminating positive practices and research.